Trying to escape her overbearing mother, vintage kitchenware enthusiast and soon-to-be columnist Jaymie Leighton retreats to her family's cottage on Heartbreak Island. While there she hopes to write an article about the Ice House restaurant, owned by good friends and neighbors, siblings Ruby and Garnet Redmond. Once an actual icehouse, the restaurant is charmingly decorated with antique tools of the trade, including a collection of ice picks. One night, while working on her article, Jaymie overhears an argument and, ever the sleuth, sets out to explore. But when she stumbles upon a dead body her blood runs cold. It's Urban Dobrinskie, whose feud with the Redmonds is no secret, and he's got an ice pick through his heart. Now Jaymie's got to sharpen her sleuthing skills to chip away at the mystery and prove her neighbors' innocence-before someone else gets picked off . . .
Victoria Hamilton is a pseudonym for nationally bestselling romance author Donna Lea Simpson. Her books include the Lady Anne series, the Awaiting series, and many stand-alone titles. 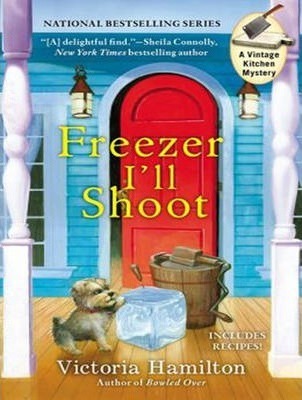 Victoria is also the author of the Merry Muffin Mystery series. "AudioFile" Earphones Award winner Emily Woo Zeller has been described by "AudioFile" magazine as doing "an extraordinary job of varying the voices in the dialogue without losing the intimacy of the story." While she specializes in Asian American narratives, Emily's work spans a broad spectrum, including young adult fiction.